Wheat is everywhere. It’s in bread, pasta, pastries, biscuits, pizza, batter, cereals, soups, sauces, instant drinks, salad dressing, processed meats and sweets, to name but a few. The western diet is so infatuated with wheat that most of us eat a kilo or more a week. So why do we love it? It’s simple. It provides the texture of our pasta, the spring in our bread, the thickening in our soups and sauces, and the crunch in our batter and pastries. But what some of us crave, others look to avoid. They study ingredients on packaging and travel across town to find processed foods that don’t contain wheat. 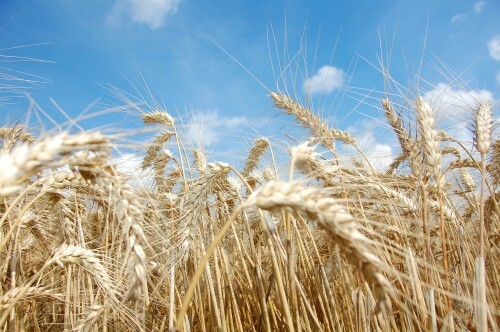 While they may enjoy the texture, spring, thickness and crunch, they don’t feel well after they eat wheat. Some have a sensitivity to a small set of wheat proteins called gluten. For a subset of people their reaction is so extreme it’s defined as coeliac disease. But most people who avoid wheat are not intolerant to gluten but rather to some other substance in wheat. Scientists agree this is likely to be other proteins found in the wheat grain, but it is typically unknown what the culprit is in each case. This is a frustrating mystery for wheat sensitivity sufferers which hangs over their café breakfasts, luncheons with friends and social dinner parties. The full set of proteins that make up wheat grains has only recently been revealed, with details published last month in The Plant Journal. These proteins make up the wheat proteome and have been exhaustively mapped out for the first time in wheat by research conducted here in Australia. With this discovery we now know that, beyond gluten, thousands of different proteins can be found in wheat grain. Some of them we didn’t even know existed before this research was undertaken. We know when they are made during grain development and we know if they are also found in other parts of the wheat plant such as the leaves, stems and roots. Each of these long wheat grain proteins are digested in our gut to become short peptides. That means there are hundreds of thousands of different peptides that can be derived from wheat. Most are harmless and good nutrition but for some people, a set of them will make us unwell. Only now that this mapping of the wheat proteome has been completed can we measure each protein separately and see how abundant they are in different varieties of wheat. This information enables scientists to use mass spectrometers to sift through proteins and peptides by subtle differences in their weight – a difference that can be smaller than the mass as a proton. We can literally dial up the masses of a particular set of peptides and set the mass spectrometer to work measuring them. The technology is at the cutting edge of new blood tests for disease. It can now be applied to make new measures in wheat. This means we have a remarkable new opportunity to see wheat in a novel way – as a complex set of proteins that can work for us, or against us. This breakthrough not only shows us the list of proteins in grain. When paired with wheat genome data (information about the complete set of genes in wheat) it tells us for the first time which of the 100,000 different wheat genes are responsible for making each of the proteins. Armed with this new information, things really can change. We will ultimately be able to determine which proteins in wheat are causing people to feel unwell. We will then be able to breed wheat varieties that contain less or none of the proteins responsible. These kinds of selective changes in wheat protein content don’t need to stop at aiding those intolerant to today’s wheat. They can enable wheat varieties to be tailored to make wheats that are better for baking or brewing or thickening. They can even help us to breed wheat that is better able to survive in harsh environments, to adapt to changes in climates and is better suited to more intensive farming. This is important because wheat is not just an integral part of the western diet. It is also part of an international plan to raise crop yields to ensure we have food for the estimated 8.5 billion people across the world by 2030. Safe, benign, abundant, cheap, high quality wheats with protein contents ready for many different applications are a key part of food security and a fairer future.